Today's post was inspired by a comment on Top 10 Signs That You Are Baby Crazy (thanks Lia). She wrote about two dresses that she has saved for her future daughter. It got me thinking about whether I've saved anything for my future children. Nothing came to mind, so the thinking quickly ended. Kind of a bummer given that I consider myself a pretty sentimental person. Fast forward two days - I'm having an unrelated conversation with a friend about handmade baby gifts. We are both DIY freaks and she had come across a personalized baby quilt that she thought our crafty skills could replicate. A bunch of friends and family members each designed a piece of square fabric. Some of the squares had embroidered images and messages. Photos had been printed on some of the squares. One square had sequins and sparkle (yes, the quilt was for a girl and yes, sequins pose a bit of a choking hazard...ooops). All the squares were then sewn together. The end result was a one-of-a-kind love letter to the baby. Not only did I agree that it was an incredible gift but I also explained that I had been given this kind of personalized baby quilt (back when I was a baby). And, I still have it. It's perfectly intact and in the back of my closet. Why did I save my baby quilt all these years? I've never thought about it, I just did. Who throws away something so special? It wasn't quite yard sale material. But, I've grown a little over the past few decades and it no longer fits on my bigger-than-a-crib-sized-bed. Though it's a truly beautiful and awesome keepsake, I have no practical use for it. It just takes up space that a new pair of shoes would happily occupy. Thanks to Lia's comment and the well-timed conversation with my crafty friend, I think I'll give my baby quilt to my future baby. Maybe it will be used as an actual quilt or maybe I'll hang it on the nursery wall as art. Turns out, I'm sentimental after all. These four squares are a good example of the ranging designs that friends and family chose - embroidering, classic quilting, crocheting and knitting. They are also a good example of the ranging color. Woah. The shift from army green to hot pink is slightly jarring, in a classic handmade way. If you attempt this amazing handmade gift, perhaps give the square makers a bit of guidance in terms of the color scheme. I can't adequately explain how beautifully the maker of the above square crafted the clown. From the real buttons on his shirt to the real feather in his cap, I am amazed each time I see it. I can't believe how well this held up. The intricately crocheted square (above) is without a single tear or hole. Motivated by all the excitement of discovering my baby blanket...rather, rediscovering my baby blanket...I started looking around my tiny apartment for more unintentionally saved keepsakes for my future children. Check out what else I found. I have the entire three book series of World Treasury of Children's Literature. Though, they're a little dusty. 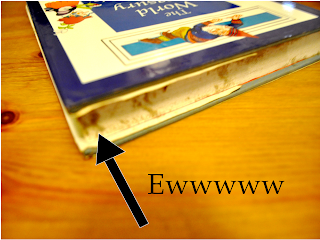 Yes, those dark squiggles on the edge of the books are clumps of dust. But, the cover itself is in great condition. I'll just have to pull out buy a duster and put it to use before the next generation arrives. While I'm on the kick of finding old, cool memorabilia, check THIS out. That's right, it's Marky Mark written by Marky Mark. Remember when Mark Walberg went by Marky Mark? I certainly do. I think I still know all the lyrics to Wild Side: "Little Tiffany, only thirteen, went to the city..."
Every new life that enters this world gives us a reason to celebrate life. These new-born lives give us a reason to keep going.We celebrate life. Since I make baby clothing/goodies for a living, I feel it necessary to save one of every cute thing for my future children (what if I can't get the robot fabric in a year from now!?). The shoebox underneath the bed gave way to a plastic storage tub, and now a drawer. Getting a little ridiculous, but at least my kid will be decked out!